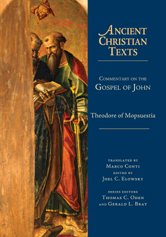 Theodore of Mopsuestia serves as one of the most important exemplars of Antiochene exegesis of his generation.While charges of heterodoxy against Theodore may not be entirely justified, there remains an apparent dualism in his Christology that should be critically viewed in light of the later Chalcedonian formula. With this caution, there still remains much that is valuable for contemporary readers, whether preachers, students or lay people interested in the early churchs understanding of the Gospel of John. Here for the first time is a complete English translation of this valuable work, ably translated by Marco Conti and edited by Joel C. Elowsky.